Since our last two seasons were poor years for olive trees and production was low, we are currently being quietly optimistic that this 2016 season breaks this cycle. In 2015 we had a very very dry Spring marked by a round of “Santa Ana” winds in May — very hot dry winds that blow from the east, which is the desert. During a two week period we had winds over 80 mph, 110F air temperatures and zero humidity. The olives on a lot of the trees dried up and fell, despite irrigation. The poor things looked looked like raisins. We were able to manage with low production to keep the orders fulfilled … but just barely. This summer so far looks very good. The trees are all producing very plump olives. Although the temperatures are elevated at 100F+ daytime, the winds have so far been calm. 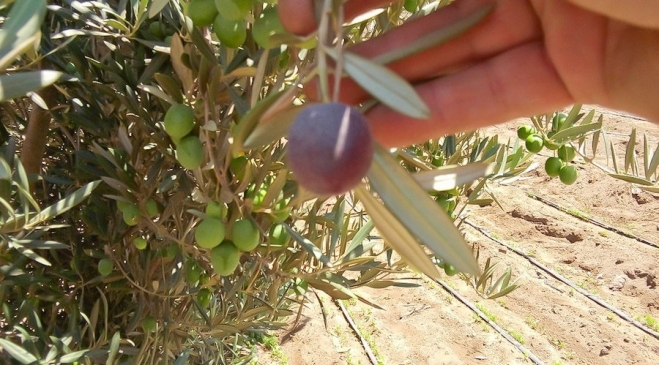 The olives are now past the stage where high temperatures can do any damage. This is the way the trees should look at this point in the season. The olives are still growing and getting ready to ripen. 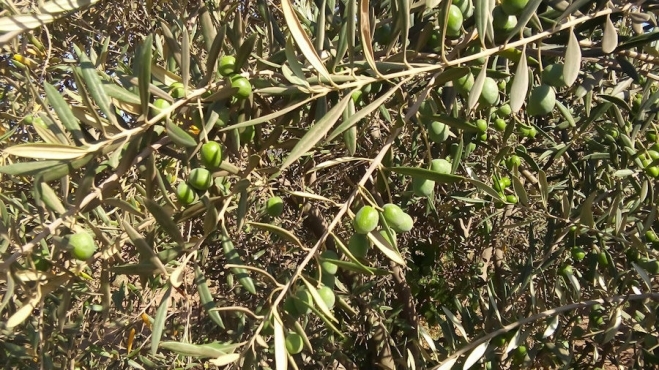 In fact, we are beginning to see some early ripening of a few olives, several months before normal. The purple olive below was photographed on August 12. However, we still have to deal with a minor potential problems that is lurking. There is a tiny attack underway at the moment by a species of fly that likes to burrow into the olive and lay their eggs. So far this has affected a very small number of olives in one area of the farm. The inside of the olive in the picture above has several active larvae (brown areas) that are visible when we open the olive. We are combating this minor attack with traps and citric acid spray, which was the subject of a previous blog article – Seagate Insect Control. 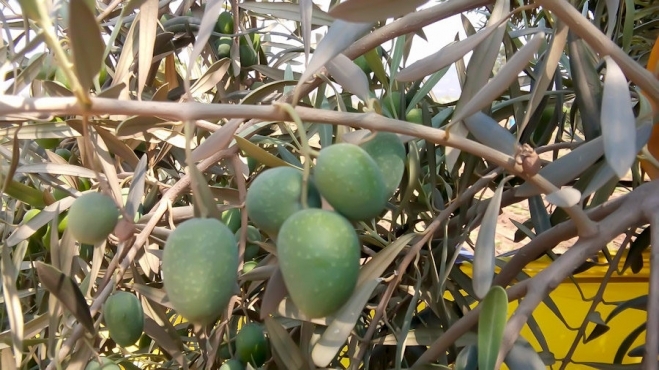 It is extra work to accomplish this and there will be some losses of olives to these insects since we do not spray the trees with pesticides. However, that is the nature of the game you play when you don’t spray your trees with chemicals. 2016 happens to be a very important season for us. We installed a new olive processing line in 2014, but have had to delay the Alfa-Laval engineers (the equipment manufacturer) from visiting our plant for the last two seasons because of the lack of olives. We could not risk flying these people over from Italy in order to start-up the equipment and train us in its operation when the there was not going to be a constant flow of olives coming into the plant. We plan to schedule the engineers and the start-up date for the new equipment in early November. Were we just dealing with ocean resources, we could easily go out and capture what we need. However, farming is a completely different story, where Nature can make things a lot more difficult for us due to our climate zone in Baja California. The fish pictured below is not one that we capture or process. He is a yellowtail snapper, who is purely there for enjoyment, his own and yours.